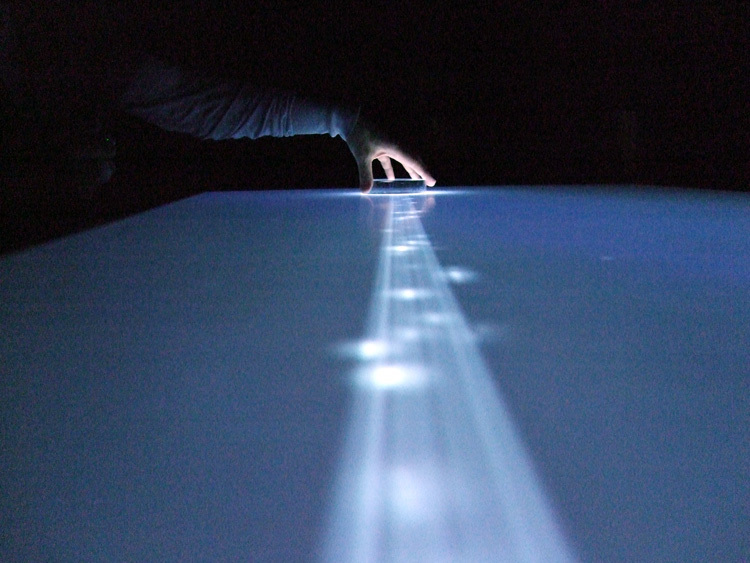 Infractor is an interactive, artistic application that has been developed for a multitouch-table. It is based on the article database of the New York Times. 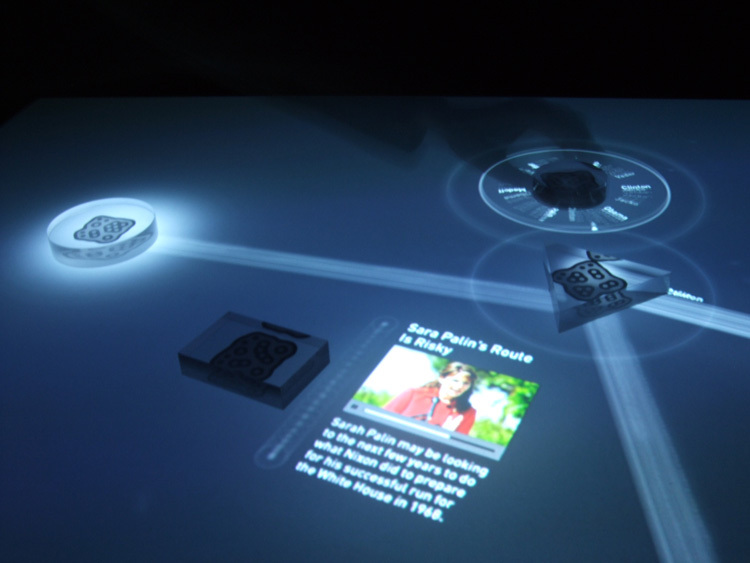 The information can be searched, filtered and read by putting physical objects on the interactive surface. of the Potsdam University of Applied Sciences. 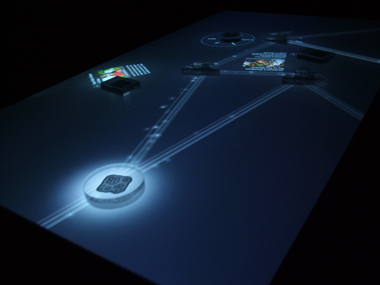 The multitouch-table is by many ways better than applications based entirely on a screen and controlled by mouse interactions. The interaction can be designed more contextually and intuitive, the information can be presented more approachable. As well it is possible to work together at the same application with more than just a single person. There are many possibilities within a news portal in working with, processing and making tangible great amounts of information. 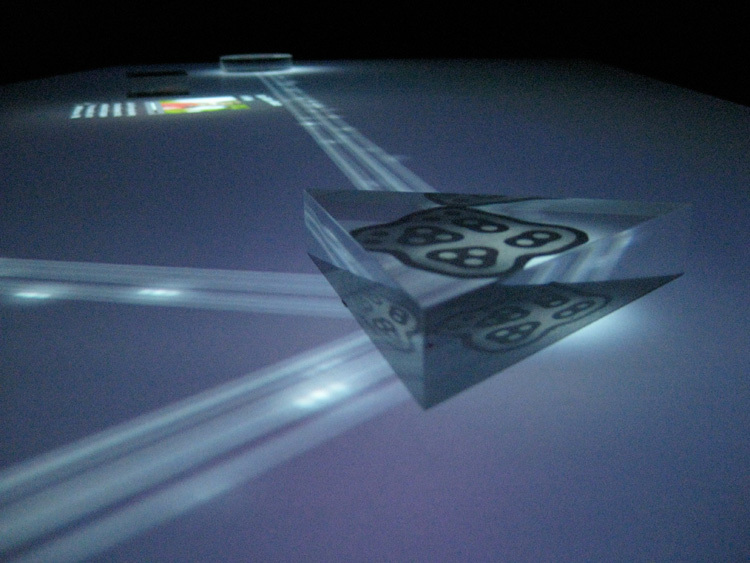 Infractor is a metaphor for the light and its aberration by prisms. The interactions related to that are used to research, filter and display articles. 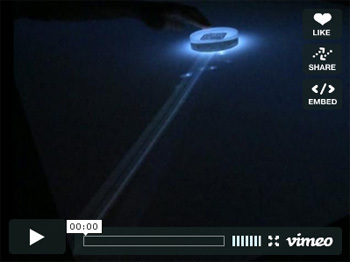 The interaction with the table is realized through physical Plexiglas objects. Each object is used differently respective its function. At first all available articles are placed as particles on the empty table. Each particle contains information such as the title, the actual text and further media like pictures and videos. This information is at that point not yet visible. 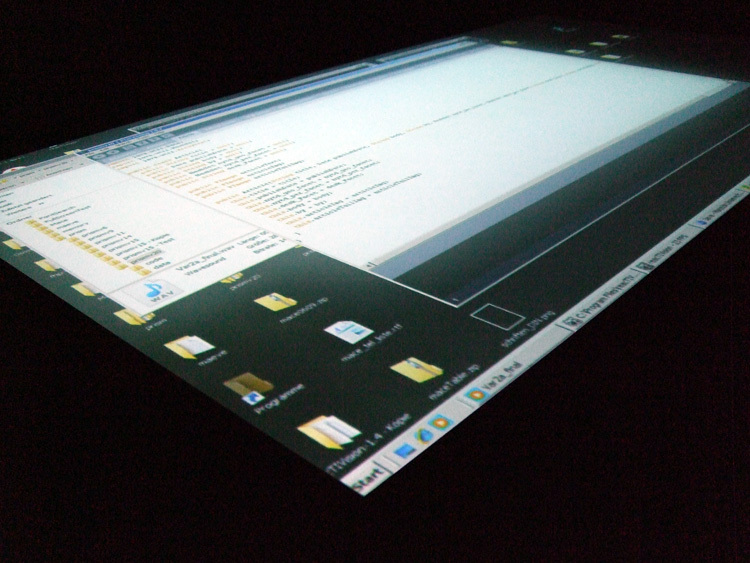 A source object is put in any place on the table in order to bundle the loose information. The object gathers now all the particles and displays them in a ray. The particles move randomly inside of this ray. To be able to filter and screen them closer the ray is split further with the help of prisms. With controller objects the prisms are given values that display thematically corresponding articles. Each controller object includes certain categorical values such as individuals or countries. 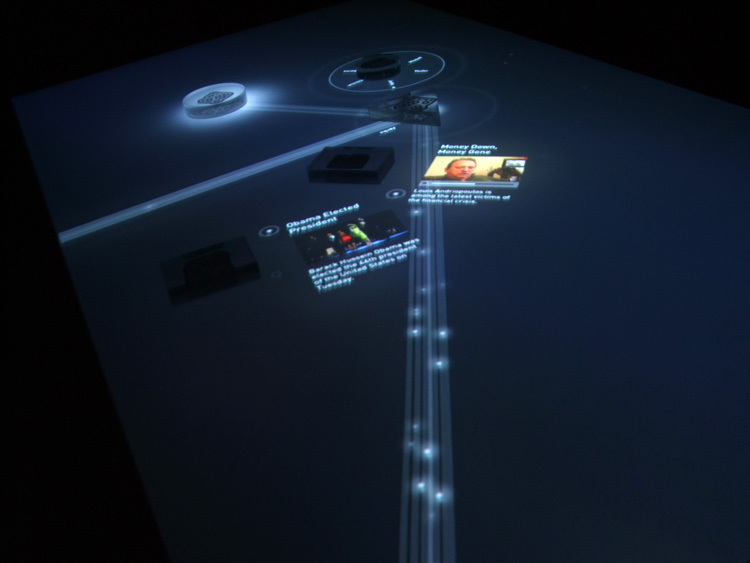 When such a controller slides close to a prism, a menu appears. By rotating the controller it is possible to choose different values out of a category, i.e. category: person; value: Obama. The chosen value is assigned to the ray. Another object, the magnet, allows one to see more information or the complete article. If it is put on the ray, all the particles are dammed and fewer particles are eventually let through. A particles visible content of information increases because of the decreased amount of information. The titles become visible to the user and he can decide more concrete which articles he might be interested for. To read an article, the magnet is put on a ray. This makes the particle come closer and the article becomes visible. The user can gather and read the article. When the magnet is removed from the table, the article disappears. In any case, if the wrong side of the object is put on the ray, the particles are shed. The purpose of this function is to make the functionality of this object playfully close to the user. The user can learn the simple and logical concept of the application very fast and in a playful way. He can work together with others on the table and search for all kind of information. The first impression of Infractor doesn't imply to a tool with which one can research the news, and it is exactly this that makes the allure of the application. The application has access to the API of the New York Times that provides all information from 1985 to the present. The project has been carried out entirely in processing. 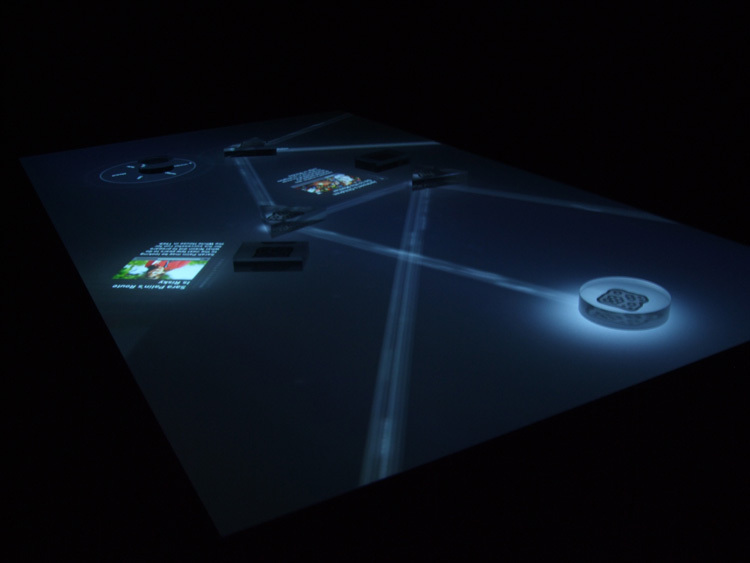 The reacTIVision-software was used for the tracking of the objects. The interactive table used for the project was designed for the mæve-installation by students and personnel of the Potsdam University of Applied Sciences.